And so it's Sweden, not Italy, that have booked their spot at next summer's World Cup. Having beaten the Azzurri by a single goal in Stockholm, Sweden held them to a goalless draw in a packed San Siro ensuring that Italy, four-time world champions, would not be in Russia next summer. This was, of course, the first qualifying campaign Sweden had played since the international retirement of Zlatan Ibrahimovic, arguably the greatest player in their country's history. 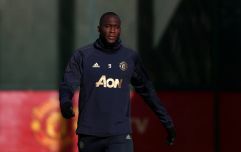 Predictably, as soon as the full-time whistle was blown in Milan, many were quickly speculating as to whether the Manchester United striker, who called time on his career with his national team after Euro 2016, might be open to a return. The world didn't have to wait long for the 36-year-old to post a response to his countrymen's qualification. Within an hour of full-time, Ibrahimovic shared a picture of the Swedish team on the San Siro pitch, accompanied by a three-word caption. 'We are Zweden', it read.